The Zambian and Turkish Governments have agreed to immediately start implementation of the signed Memorandum of Understanding (MoU) on co-operation in the field of Forestry. Minister of Lands and Natural Resources, Jean Kapata and Turkey’s Minister of Agriculture and Forestry, Bekir Pakdemirli agreed during a bilateral meeting in Ankara today that it is important for the two countries to start implementation of the issues contained in the co-operation agreement for the mutual benefits of the two countries. She also expressed concern about the high levels of deforestation in Zambia arising from indiscriminate cutting down of trees for charcoal production. Ms Kapata said to address the problem of deforestation, Government has embarked on a project to buy 15,000 seedlings of a special solid bamboo species at a cost of K375, 000. The Minister said Government will give each province 1,500 seedlings of this special solid bamboo species, which will be distributed to all districts. “This species of solid bamboo is special and once one seedling is planted, you have almost 200 sprouts. It has a number of advantages because the charcoal that will be produced from it will last longer than the one which is coming from the trees that we have and also it takes only four years to mature, it is drought resistant and is also nutritious for animals like cattle and goats,” Ms Kapata said. The Minister called on Zambians to support the Forestry Department as Government undertakes the project. 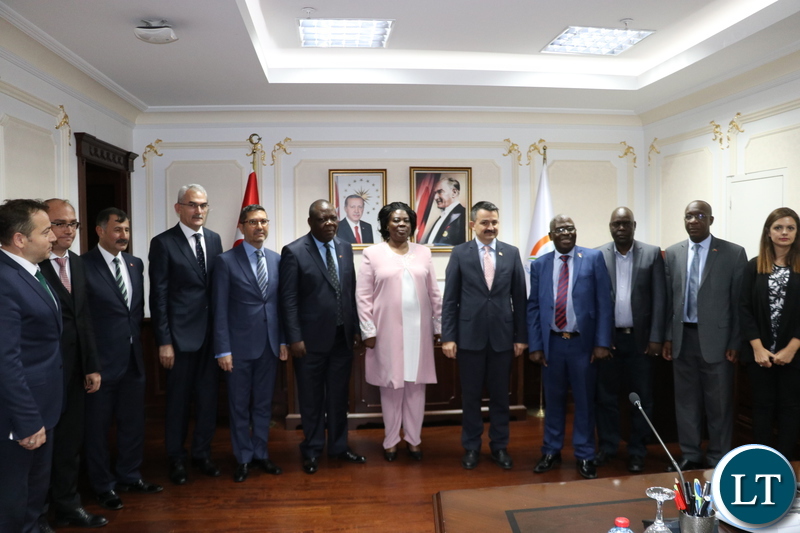 And Mr Pakdemirli said the Turkish Government is ready to provide the necessary support to the Zambian Government to ensure the successful implementation of the MoU. Did anyone consider the climatic requirements of those bamboo trees? Will they grow in Zambian weather? what off the pests and their effect on indigenous plants? Hope we were not duped into spending money we do not have. PS.You do know that the Turkish currency has plummeted right? There is nothing we can learn from Turkey in this regard. Charcoal is needed in Zambia by a lot of households. I doubt we have a serious deforestation problem in Zambia. I mean Zambia is still 90% bush, so go figure. If you want to save trees, these simple measures will go a long way. Why does this government insist on courting rogue states? Somebody misses 6 penalts and they still give him chance hoping something bad happens to goal and ball will go in. If you voted in a convicted fraudster , any one has a chance at the presidency. Pleas carry out research on the effects of introducing a non native tree to Zambia , where is this bamboo grown outside its native habitat ? If experts give the all clear , cutting of indginous trees for malasha should be banned when this tree starts to give our forests time to recover and to controll this non native bamboo. Mrs kapata can we also have an update on the forest ban of Chinese indiscriminate exports of our trees ? Last we heard was there was to be no export of unfinished wood products ? Otherwise we’ll done Mrs minister. It is indeed a cosalation to note that even a convicted fraudster can be president , anyone has a chance badala…..
Mr. President please be cautious with the implementation of this MOU with Turkey. Turkey is in a hurry to implement this MOU while battling sanctions with the USA. My warning is: USA, AND ESPECIALLY DONALD TRUMP, DEALS VERY RUTHLESSLY WITH ALL COUNTRIES THAT ARE SUPPORTING THEIR ENEMIES – FOR NOW TURKEY IS AN ENEMY OF USA ON TRADE. IF ZAMBIA IS SEEN TO BE CORROBORATING WITH TURKEY THEN WE SHOULD EXPECT THE WORST. OUR KWACHA WILL TUMBLE TO THE MAGNITUDES THAT WE HAVE NEVER SEEN BEFORE. By the way remember that SATA already removed 3 zeros from our currency, we don’t want to be removing more zeros. I THINK THIS IS THE REASON WHY HH IS FORESEEING THAT VERY SOON ZAMBIA WILL BE FORCED TO PRINT MONEY WITH THE RESULTANT EFFECT OF VERY HIGH INFLATION. IF I WERE LUNGU I WOULD HAVE PUT ON HOLD THE MOU WITH TURKEY UNTIL THE DUST SETTLES BETWEEN THEM AND USA. After all “WE ARE SHIITT HOLE KOMBONIS” – said by Trump. But why are we aligning ourselves with rogue states? It looks like China is not our darling anymore. Hang on tight. It is going to get worse before it begins to get better… One comedian said “hang on to your lily white butts”. In this case, your little ebony ones. Y’ain’t seen nothing yet!!! Oil prices are likely to go higher. Use local knowledge to advance. What do you have Universities for?